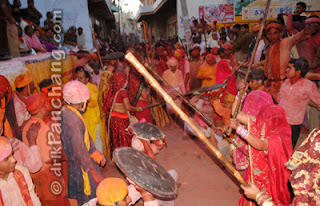 In 2013, the world famous Lathmar Holi at Barsana would be played on 21st March. Holi celebrations are none other than those of Mathura and Vrindavan, the birth place of Lord Krishna. In most temples, the Holi festivities start on Vasant Panchami and culminate after 40 days on Phalguna Purnima. The last 8 days out of total 40 days are known as Holashtak. The most visible Holi is played during these eight days. The last day of Holi falls on Phalguna Purnima and it is the most important day when people burn Demoness Holika symbolically in huge bonfire. The most prominent Holi with wet colors and water is played next day after bonfire and it culminates the Holi festivity. 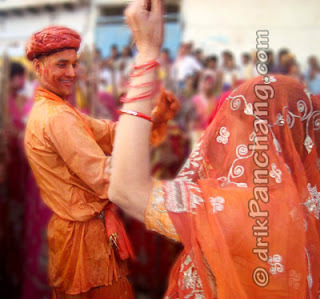 The world famous Lathmar Holi at Mathura is played in Barsana which is remote satellite town of Mathura. During Lathmar Holi women folks try to protect themselves and symbolically beat men with wooden sticks to resist any attempt to smear them with wet and dried colors. It is believed to be the most ancient way to play Holi started in the time of Lord Krishna. The Goddess Radha, consort of Lord Krishna, was from Barsana and Lord Krishna was brought up in Nandgaon. As per Hindu mythology Lord Krishna and His troop used to visit Barsana to play Holi with Radha and other female cowherds known as Gopis. This tradition of playing Holi between both towns is still kept alive by these village folks. As per tradition Gulal, the dried colored power, is sent to Nandgaon by people of Barsana as an invitation to visit and play Holi with the female folks of Barsana. The invitation is send on the first day of Holashtak and on the next day men folks of Nandgaon visit Barsana to play Lathmar Holi. In 2013, the invitation to play Lathmar Holi would be sent on 20th March. After receiving the invitation men folks of Nandgaon would visit Barsana on 21st March. On the same day there would be community singing at Shri Jee temple and after that historic and mythological Holi of Lathmar would be played at Rangili Gali in Barsana. The new Keshava Dev temple at Janmabhoomi celebrates Holi on Rang Bharani Ekadashi which falls about 4 days before Purnima.